Despite the wide range of the GPU coverage we do here at AnandTech, from reading our articles you would be hard pressed to notice that AMD and NVIDIA have product lines beyond their consumer Radeon and GeForce brands. Consumer video cards compose the bulk of all video cards shipped, the bulk of revenue booked, and since they’re targeted at a very wide audience, the bulk of all marketing attention. Consequently consumer cards also take up the bulk of the press’s attention, especially since new GPUs are almost always launched in a consumer video card first. The truth of course is that there’s a great deal more to the GPU marketplace than consumer video cards; abutting the consumer market is the smaller, specialized, but equally important professional market that makes up the rest of the desktop GPU marketplace. Where consumers need gaming performance and video playback, professionals need compute performance, specialized rendering performance, and above all a level of product reliability and support beyond what consumers need. They need the same basic product as consumers – a high performance, feature-packed GPU – but they need to use it in entirely different ways. As a result of these different needs the GPU marketplace is traditionally split up into three segments: consumer, professional graphics, and compute. Among these segments consumer products typically launch first, with professional and compute products following 6 to 12 months later based on further driver development and qualification needs. The end result is an interesting product cascade that sees the true, unrestricted performance of a GPU only finally unveiled several months after it launches. This leads us to today’s product review: AMD’s FirePro W9000 video card. Having launched their Graphics Core Next architecture and the first GPUs based on it at the beginning of the year, AMD has been busy tuning and validating GCN for the professional graphics and compute markets, and that process has finally reached its end. This month AMD is launching a complete family of professional video cards, the FirePro W series, led by the flagship W9000. As always, the latest rendition of the FirePro family will be taking their place as AMD’s professional graphics card lineup. Having a dedicated professional graphics card lineup allows AMD to offer features and functionality – primarily rigorous application certification against a driver set tuned for high reliability – that while not necessary for consumer cards are critical for professional users; and of course to charge those users accordingly. FirePro also is distinct for being AMD’s only in-house video card offering, with AMD directly producing, selling, and supporting the products as opposed to farming that work out to third party partner companies (as is the case with Radeon cards). 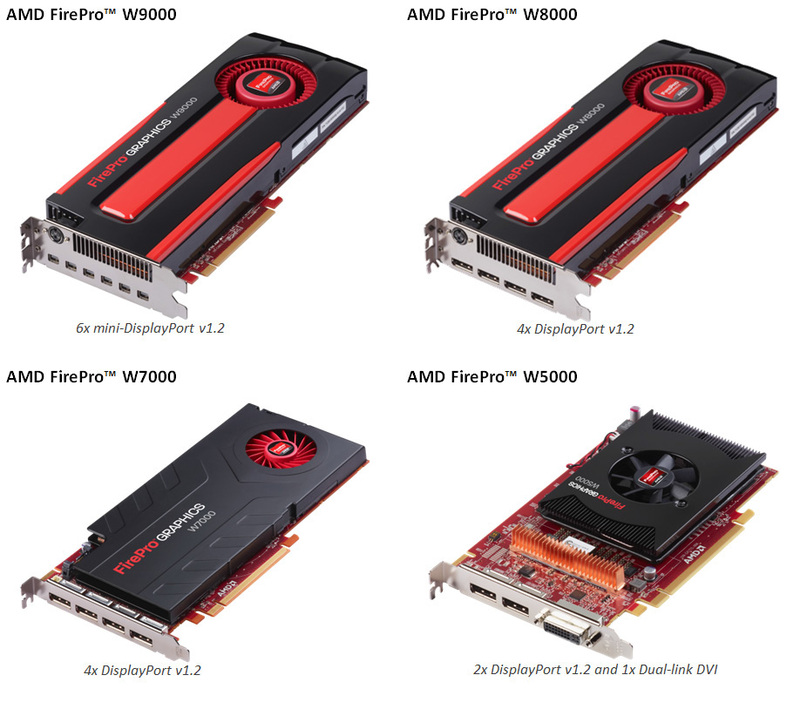 Taking a quick look at the specifications, if you’re familiar at all with AMD’s Radeon HD 7000 series lineup, then the FirePro W series lineup should look very familiar. As with the FirePro V series and past iterations of the FirePro, the latest rendition of the FirePro family is effectively comprised of professional certified versions of existing Radeon HD 7000 series video cards, which means the hardware is nearly identical to AMD’s consumer products. The big new with this week’s launch of course isn’t just that AMD will be replacing the 40nm FirePro V series with the 28nm FirePro W series, but that they’re doing so with Graphics Core Next, their modern compute-oriented GPU architecture. With FirePro pulling double-duty as both AMD’s professional graphics card and their compute card, this makes GCN all the more important as it brings with it potentially massive compute performance improvements that significantly shore up the V series’ weakness in compute. We’ve often said that the full power of GCN hasn’t been tapped by the consumer-oriented Radeon series, so now with FirePro we’ll finally get to see everything GCN can do. We’ll dive into greater detail later about the individual products and their specifications, but for now we’ll offer a quick overview of the FirePro W series. Altogether the W series is to initially be composed of 4 cards, the W9000, W8000, W7000, and W5000. The former two are based around AMD’s high-end Tahiti GPU while the latter two are based around their mid-tier Pitcairn GPU, which creates a clear distinction between the two groups. Whereas Tahiti was built for both strong graphics and strong compute performance, Pitcairn is more tuned for graphics, and as FirePro products that distinction has not changed. As a result high performance computing – particularly double precision – is going to be the domain of W8000 and W9000, along with AMD’s best graphical performance. W7000 and W5000 on the other hand still offer respectable single precision compute performance but lack the double precision performance of the larger cards, making them better suited for pure graphical workloads than for compute or compute mixed with graphics. Moving on, much like AMD’s consumer product launch earlier this year they will enjoy a couple month lead over NVIDIA in getting 28nm cards out into the professional market. So for the time being AMD will have a generational lead over NVIDIA’s competing products, the Fermi based Quadro series. Unlike the consumer space though the hardware upgrade pace in the professional market is much slower, so while this still gives AMD an advantage it won’t be as significant as their launch advantage in the consumer space. On that note, when it comes to competition, pricing has been a big part of AMD’s strategy. Typically, AMD has undercut NVIDIA on pricing for equivalent professional products in order to cut into NVIDIA’s very large share of the market. Professional graphics margins are high enough that AMD can afford to sacrifice some of their margin for market share. For the initial launch however this won’t strictly be the case, due to the fact that the Fermi Quadro series is slowly on its way out – to be replaced by the K5000 and future cards. With a SRP of $3999 for the W9000 it’s roughly as expensive as the Quadro 6000 at current prices, and the situation is similar for the $1599 W8000 compared to the Quadro 5000. Eventually NVIDIA will finish refreshing the Quadro series for Kepler, and when they do it would be reasonable to expect that AMD’s pricing will undercut NVIDIA’s new prices; the Quardo 6000 did have a launch MSRP of $4999, after all. Finally, on a quick housekeeping note, as you may have noticed in the title we are splitting up this article into two parts. Part 1 will be focusing on the tech, the specs, and the market, while part 2 will focus on benchmarking and our performance analysis. This is so we can get the first part out at the start of this week, as opposed to holding it our extended benchmarking is complete. So if you’re looking for specific figures and performance numbers, please be sure to check back later this week for the full performance rundown. Over the years I've always popped over to this page to read the latest news and especially articles yet over the last year, or maybe a bit more, the articles haven't exactly been flowing. is the site slowing down? 100 percent agree with your assessment that the pro cards are a rip off. The chips are the same chips as in gaming cards. The only difference is a few switches in firmware that cut off options when run in gaming cards. That firmware is also developed by the same developers; I say this after having worked in a similar field where the company I worked for marketed RIP software designed to print to copiers. All the features were in the software, but customers had to pay sometimes substantially extra to enable some of those features. In my opinion, anyone who thinks that there is a separate team developing "pro" drivers is mistaken. With a PC that has enough processing power, IMHO, most professionals will not need the "extra capabilities" that the pro cards offer over gaming cards. Perhaps the only reason a pro would need a pro card, if you believe the marketing coming out of the pro card realm, is because you are working with a model that has thousands of parts. All these videos illustrate is that certain hardware accelerated features are turned off at the bios and software level. It is an illustration of intentional vender modifications of a piece of hardware to differentiate the two in order to improve the profit of the other. Wrong. With a professional card, you pay for both the validation and the software, neither of which are professional quality in the consumer variants. "That firmware is also developed by the same developers"
"Wrong. With a professional card, you pay for both the validation and the software, neither of which are professional quality in the consumer variants." The marketing departments have done their jobs very well or you are "pro vendor shill," IMHO as that is what the vendor wants everyone to think. As I previously stated, having been in more than one position where the companies that I worked for sell "professional" software, it is not the case. If you really are a professional graphics (or compute) user and would rather take the chance by opting for a non-validated $400 card instead of a fully-validated and backed by the hardware and software-vendor $4,000 card, then you have got your priorities wrong. That or you're being seriously underpaid for the sort of work you are doing.